Hi everyone! It’s been a while since my last post and even since a month and a half have passed since my last post, no new models have been finished. But fear not. I’ve been away from home, had some nasty shifts at work, nasty cold and a modelling competition to help organize and run and modelling time was pretty low. But don’t worry, I’ve been somewhat active in the meantime and even managed to try myself at something totally out of my comfort zone, modelling wise. But more on that later. I am pretty sure you’ve all seen talks about different paint manufacturers and their accuracy compared to some paint chips? Well in the past two weeks I’ve stumbled upon some interesting facts regarding paints. We’ve all heard that Soviet/Russian paints are of dubious quality and that they used whatever paint they found? Well that’s not entirely true, as painting camouflages were always set on paper, including which exact paints to use. Sometimes the quality of them varied from factory to factory but the standard was there. Looking at new fighters, especially Fulcrums and Flankers, faded paintjob has less to do with the poor quality than the fact, Russia has most of its aircraft fleet parked on tarmac all year around; given the fact Russian winters are one of the worst while summer can be extremely hot, fading of the paint is to be expected. But what about the US military aviation and its paints? You’ve probably heard about Federal Standard. All colours defined by it are precisely defined, so in theory, all aircraft should look the same, when painted in the same camouflage. But if you look at the photos, you will see that they don’t. Why? First interesting fact is that by my source, paints are allowed 10% tolerance in brightness and 10% in tonal value compared to Federal standard. If this data is correct, the difference can be a whopping 20% difference between two paints, labeled as one FS colour. Second fact is that when aircraft are repainted, some paint is delivered premixed while other paints might be mixed at base, which increases chances of unique shades of a certain FS number. Third fact came from a USAF groundie, who claimed that they deliberately mixed certain paints darker, to visually differentiate airframes from each other in the pattern before landing. If you take in account all of this and add paint fading and weathering, it really doesn’t matter which brand of paint you choose in the end – choose the one you are most comfortable with! 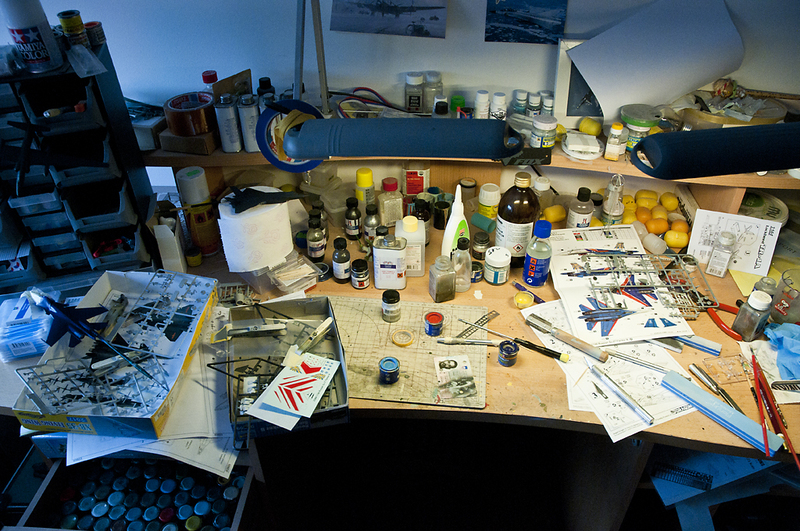 So what’s going on on my workbench? Currently there are FOUR small scale models in progress, most at the finishing stages of completion. 1:144 scale infamous TR-1A(U-2S) and chinese mighty J-20 from Cyberhobby are really nice kits benefiting from the slide-mould technology. Trumpeter’s Su-27 Flanker is also a great little kit, but some things missing from the kit bother me a lot, but are easily scratch built and the (not so) little Flanker has great potential. The fourth kit on the bench is Cyberhobby XB-35 in 1:200. You may remember my previous build of it’s jet cousin YB-49 a couple of years ago – they will look great one next to each other – the only shame is, they chose the 1:200 scale instead of 1:144, as Revell’s kit would nicely fit among its predecessors. Anyway, you can expect to see first of the finished models next week on my pages, with feature articles in Scale Aircraft Modelling magazine shortly afterwards. Stay safe and keep modelling! Those little Trumpeter Flankers are nice for the scale aren’t they?? Yes they’re missing some details (and they’re really J-11s…)…but they build up so cleanly!